‧ The thin wall counter-bore of the NL enables it to be installed into single, variable or multiple thickness materials with the spin-spin tool. It can also be installed with the spin pull tools for ultimate installation speed. ‧ Low profile head is ideal for our of round oversized holes. ‧ Knurled body for increased spin out resistance. 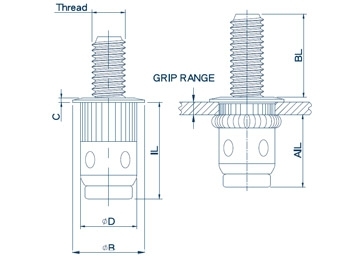 ‧ 6-32 to 5/16-18 and M4 to M8 thread sizes. ‧ See page 31 for dimensional details and part numbering.